Before we powered them, programmed them and set them running in flawless perfection, we lifted our tools with our hands, sending our individuality into the wood. As we did, each board spoke a different story; each plank a unique reflection of its maker. Now you can bring that simple elegance into your home once again with Virginia Vintage, the original engineered hand-scraped flooring from Anderson. Inspired by an atmosphere unique to coastal living, Anderson’s Coastal Art™ suite of hardwood floors, distinctive colors and textures evoke memories of time spent by the sea. Recall the wide planks of the boardwalk, the curative effects of the salt air, the play of light on a rippling ocean. Enjoy the art of the coastal lifestyle. Reminiscent of a hardwood floor from the 18th Century, yet able to meet the lifestyles of today, Colonial Manor™ is individually hand-scraped and handstained. The 3/4” thickness of each solid plank offers a more durable floor that is both easy to live with and easy to care for. Unique… Unmistakable… Subtly beautiful. Vintage Crossfire™ is all this and more. The rich maple colors, wide width and subtle cross-grain sculpted texture adds dimension and depth to your room while crossing lifestyles to look perfect with any decor. The Old Paint™ Collection is reminiscent of the timeless beauty of days gone by. To achieve this effect, each board has been painted, distressed and sanded by hand. The end result captures a grace and warmth of a floor touched by time and worn to perfection with a range of colors and textures that are sure to make a statement in your home. The day’s over. Now it’s time to relax. Time to enjoy the lifestyle you have worked so hard to achieve. 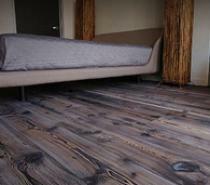 Your at home with your Vintage Sanctuary Plank™, hardwood floor. The rich maple colors and handscraped texture reflect the flickering flame of candlelight or a fire in the hearth and all is well with the world.